we noticed that the sip/pour spouts were a bit on the noisy side during use. Just don't use them during a funeral, and you should be fine! ONLY compatible with our 25 oz. 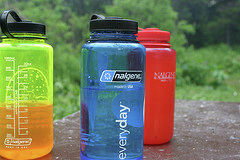 Ech2o™ water bottles. 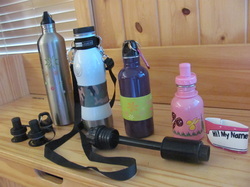 In addition, we received one shoulder strap which uses velcro to wrap around the top of the bottle. I don't see that product on the EcoUsable website anymore, so it's possible that they are no longer carrying it. EcoUsable would like to extend a 10% discount to you! Disclosure: I received these EcoUsable water bottles and accessories free of charge in exchange for my time in writing an honest review containing my own opinions. No other compensation was provided.